Greetings, geek fans! We’re less than four days away from X-Mas, and I’m going to continue giving you your gifts. Rather than reviewing my three favorite versions of A Christmas Carol, I’m going to rate one of the main characters each day, and you already know this. Today I cover the Ghost of Christmas Present. Let the geeks begin! I know, I know, how dare I put Mickey at the bottom. Well, it’s like All Stars, we’re dealing with Alaska, Katya, and Detox. There are no bad choices. Well, except for the giant. They pulled him directly out of Mickey & the Beanstalk, including his inability to pronounce pistachio. The giant set out quite a spread. Scrooge asks what it is, and is told it’s the food of generosity, which Scrooge has denied his fellow man. Scrooge counters that no one has ever shown him generosity. The giant snaps back that he’s never given them reason to. Time to go see what the world is going for X-Mas, and by world, he means Mickey. They’ve got a runtime to work with. 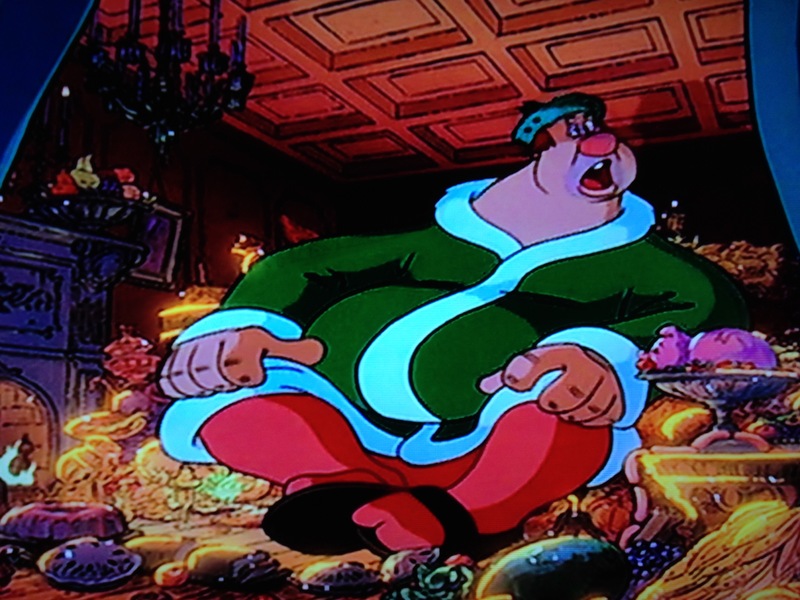 Scrooge sees Bob’s meager feast, and Tiny Tim. He actually starts to feel a little outside himself, which is good cause there’s only one spirit left. Guess he’ll be doing the heavy lifting. His name is Rio and he dances on the sand. Kidding, though this spirit is played by John Taylor of Duran Duran. He’s a rock and roll party boy, having a bash in Ebony’s hotel room. There’s no speech about generosity, he just tells her they need to get going. Unlike Miss Kathy, who teleported, with glittery fabulousness, Steve is a speedster, and they run from place to place in New York to show her how her crew spend the holidays in the fleabag motels she puts them up in. How her accountant is embezzling from her. How her niece is having fun, and wishing Ebony was there. Ebony even gets to hear a phone call from Bob’s wife telling him to quit and get home. Bob tries to use logic and say they can’t pay medical bills if he’s out of work. Ebony actually does question if Tim will live. Not his dept, he’s Christmas present. Doesn’t look good though. It may be a modern telling, but I’m still not feeling Ebony taking her emotional journey seriously. Maybe the next spirit will do it for her. Oh wait. Second of the new creations for the spirit triad, is a large, happy, Santa-like figure, but with red hair and a holly wreath. He ho-ho-ho’s with laughter, and lives very much in the moment. Given he’s the Ghost of Christmas Present, it’s to be expected. His personality is so exuberant that Scrooge can’t seem to help himself, and begins to feel some of the joy that most people feel at that time of year. He takes Scrooge to the streets of Christmas morning, and sings a song about the feelings of Christmas. This movie came out while I was in middle school. I know this because we did the songs from this movie for our holiday program in choir. It takes me back. Scrooge is so moved by the song he wants to see friends and family. He’s tasted roasted chestnuts and he wants more. More. More! Not Santa shows Scrooge family playing games, and then Kermit and his family having dinner, introducing Scrooge to the Tiny Tim played by Kermit’s nephew, Robin. Upon learning that Tim may die, Scrooge asks about the future. 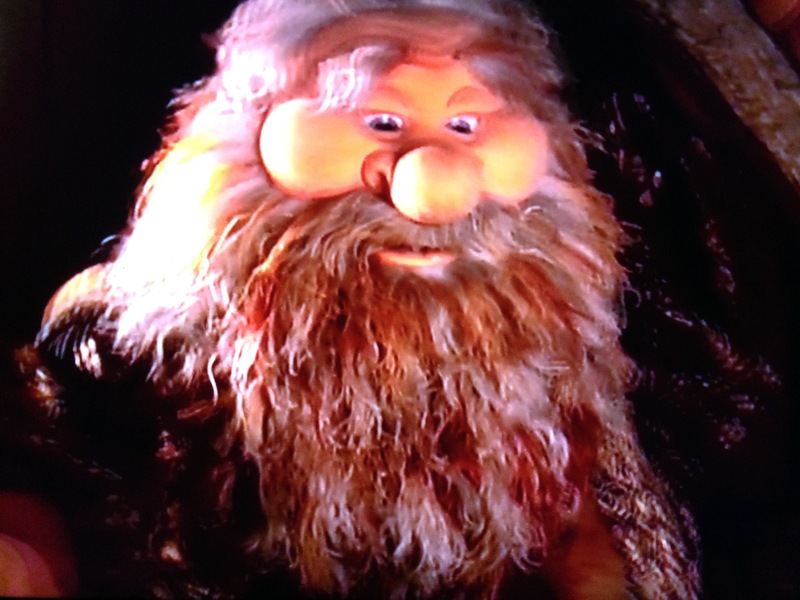 Puppet Claus says that’s not his department. His hair is now white, and his time is up. He leaves with a ho-ho laugh, and twinkle of lights. This Scrooge is taking the journey best so far, in my humble opinion. Tune in tomorrow for The Ghost of Christmas Future, as my Christmas Carol Countdown continues. Damn, I love alliteration. Until next time, stay geeky, and keep gabbing!